DETROIT – The Detroit Red Wings today recalled center Joakim Andersson from the American Hockey League’s Grand Rapids Griffins. Andersson has split this season between the Red Wings and Griffins, picking up three points (1-2-3), a plus-one rating and six penalty minutes in 28 games for Detroit and adding five points (3-2-5), a plus-2 rating and two penalty minutes in 19 games for Grand Rapids. In 204 regular-season games with the Red Wings since the 2011-12 campaign, the 27-year-old forward had registered 36 points (15-21-36) and 48 penalty minutes, notching another seven points (2-5-7) in 22 career NHL postseason games. He has also skated in 208 career games for the Griffins since the 2008-09 season, tallying 106 points (41-65-106) and 123 penalty minutes. Andersson has also appeared in 20 postseason games for Grand Rapids, accumulating 11 points (4-7-11) and helping the team win the 2013 Calder Cup championship. 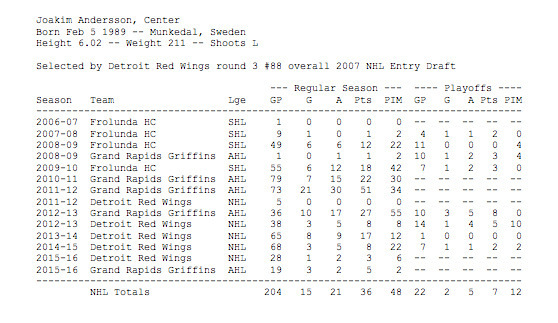 Originally drafted by the Red Wings in the third round (88th overall) of the 2007 NHL Entry Draft, the Munkedal, Sweden, native spent three seasons playing professionally in Sweden before coming to North America, earning 31 points (13-18-31) in 114 games with Frolunda in the Swedish Hockey League from 2007-10 and adding 27 points (8-19-27) in 37 games for Boras HC in Sweden’s second-tier professional league. He also helped Frolunda’s junior club to championships in 2007 and 2008 and twice earned a silver medal at the IIHF World Junior Championship in 2008 and 2009, totaling 12 points (2-10-12) in 12 games during international play.